It’s no secret that I’m a fan of Ilia but who isn’t? Their ever growing range is pushing organic make-up into the mainstream, proving that you can have luxurious, high quality products that perform AS WELL AS being ethical, sustainable, organic etc.. 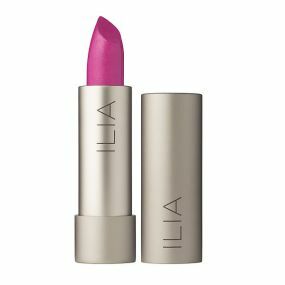 I have a good selection of the Ilia lipsticks and lip conditioners in my kit and am always reaching for them. Bang Bang was a favourite in my personal make-up bag for ages and indeed was product of the month here on the blog; however it has recently been taken over by Jump – one of Ilia’s limited edition seasonal colours. I love it. Jump is a Tinted Lip Conditioner as opposed to a lipstick so can be worn very sheerly, but you can also build the intensity up so it can be quite a bold colour too. Ilia describe it as a ‘bright pop of magenta, mixed with hints of electric blue undertones’. I find that it just brightens the face instantly without being too overpowering – you can definitely see that you are wearing colour but still in a relaxed way. I love Neon Angel which is a lipstick but am always a bit shy of wearing it as it is a really bold pink magenta so a real statement – for me Jump is much easier to wear. It is a conditioner which means it has lots of ingredients to soothe the lips (jojoba oil, cocoa butter and vitamin E) but also has a bit of a shine. Sometimes a shine can mean less wearing time but I find the Jump has good staying power, some of the brightness will go but a soft stain is left so you don’t have to reapply all the time. Apply straight from the bullet for a relaxed look, blot with a tissue and then reapply until you get your desired intensity. Try using a brush for application if you want more of a precise finish – use the brush to enhance your lip shape. For extra longevity try applying a thin layer of your foundation or concealer over your lips first, this can give the colour something to hold onto thus giving it a little more staying power. Buy Ilia in the UK at Content.